Brantley Sherrer, our manager of event operations, is the second-longest serving staff member of Atlanta Track Club. With oversight of the design and maintenance of our courses, few people have spent more time climbing Cardiac Hill than Brantley. For the 11th installment in the Peachtree 50, we asked him to tell us how he met the hill and saw its legend grow. As a bonus, he reached out to several other Peachtree veterans, who added their memories to his own. 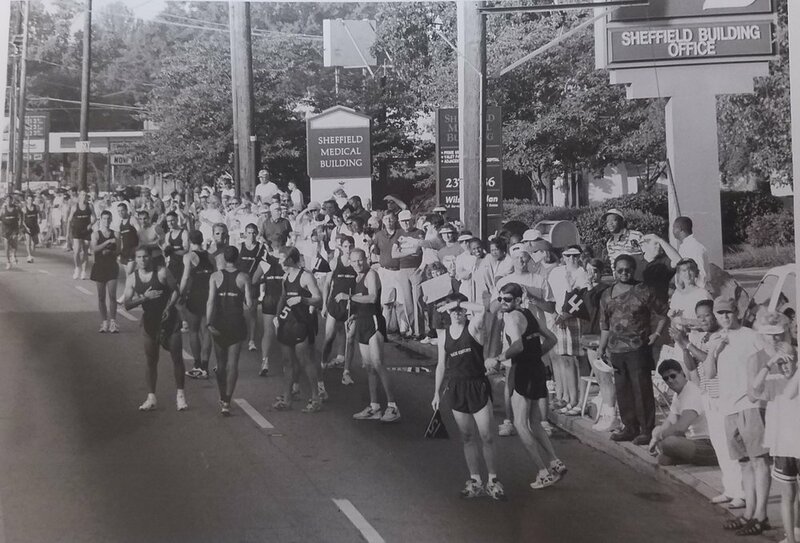 A lot of things have changed as the AJC Peachtree Road Race approaches its 50th Running, but at least one thing hasn’t: Every year, runners have faced – with anticipation, dread, determination or a mixture of all three – a small mountain almost a mile long dubbed “Cardiac Hill.” In the early races it fell about 1.5 miles into the course; today it starts just under three miles in. Does the name come from the fact that it is home to Piedmont Hospital, the Shepherd Center, and many other medical buildings? Is it a reference to how difficult it is? Maybe it refers to the fear on people's faces as they begin the ascent? Probably a combination of those options. My relationship with Cardiac Hill began not as a runner but as an employee of Atlanta Track Club when I took a job here in 1991. 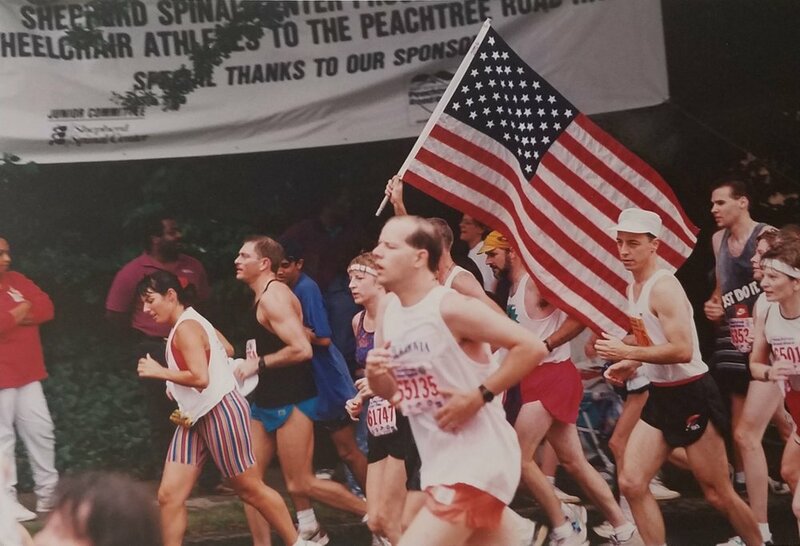 I had very little experience running and knew very little about the Peachtree Road Race. I was hired just out of college, figuring that I would work here as a “gofer” until IBM saw my resume and came calling. It’s been 27 years and IBM still hasn’t called. My first memory of Cardiac Hill comes not from any of the tens of thousands of runners, but from a business owner on the course. In the early days of Peachtree, it became a tradition to paint peaches on the road or sidewalk in permanent paint to serve as mile markers, with a mile number painted inside each peach. Every year, these peaches had to be refreshed or repainted. In the weeks before my first Peachtree, I rode around with Michael Hughes, who was the Club’s technical director, as he painted the peaches. My job: Keep him from getting run over by a car. We got to Mile 3 and Michael began painting on the sidewalk about 300 feet up Cardiac Hill in front of a Mexican restaurant. As he painted, I noticed a man looking out the window of the restaurant, his eyes wide, and he trotted out the door. Uh-oh, we were in trouble. The man came out and asked what we were doing. Michael explained. The man went back inside, and the owner came out. But rather than being angry, he wanted to tell us how honored he was to have a Peachtree Road Race mile marker in front of his place. He shook our hands and invited us in to eat. For me, this was the first sign of what the Peachtree meant to Atlanta and its people. As a runner, my first – and only – experience with Cardiac Hill, also in 1991, was not as pleasant. It was hot and humid, surprise. My longest run had been about 4 miles. A friend named David decided to goad me into doing the Peachtree. The race started. Downhill, no problem. I reached 2.5 miles (about 4 miles when you include the distance I traveled side to side to navigate the crowd), then I looked up … and up. Fine, no problem, one hill. I slowly made it up to Benihana and things leveled off a bit, great. Then we went up some more, this time much steeper. The more I slowed down, the bigger David grinned. He’d done the race before. He knew to pace himself. He knew I wouldn’t. Once on top of Cardiac, next to a long-gone sports bar named McNeely’s, I stopped and had to walk … and walk. I don’t think I picked up the pace again until Spring Street. I finished the race but Cardiac Hill had kicked the “hill” out of me. After a beer, David still likes to make sure I remember that ’91 Peachtree. In the history of the Peachtree, there have only been two volunteer course directors. I have had the privilege to work with both and I asked them about their thoughts on Cardiac Hill. If you are not running for time but just to enjoy the fun, Abbott advises high-fiving the Shepherd Center patients and their families gathered in front of the facility. The center specializes in rehabilitation of brain and spinal cord injuries. Whether you’re wheeling, running or walking, I suspect Cardiac Hill will make an impression on you. It’s tough but fair; part of the challenge but part of the fun. And once past, you can celebrate being more than halfway to the finish. The T-shirt is that much closer. The history and intricate details of coordinating the Peachtree’s medical operations. Taking a look at Atlanta Track Club’s traveling display celebrating 50 years of AJC Peachtree Road Race history. The life and legacy of the Peachtree’s first female champion. One of the Club’s longest-tenured employees details the surprising tasks that volunteers have taken on over the years at the Peachtree.